The shot noise or granular noise is the electronic noise due to the “corpuscular” nature of the charge. 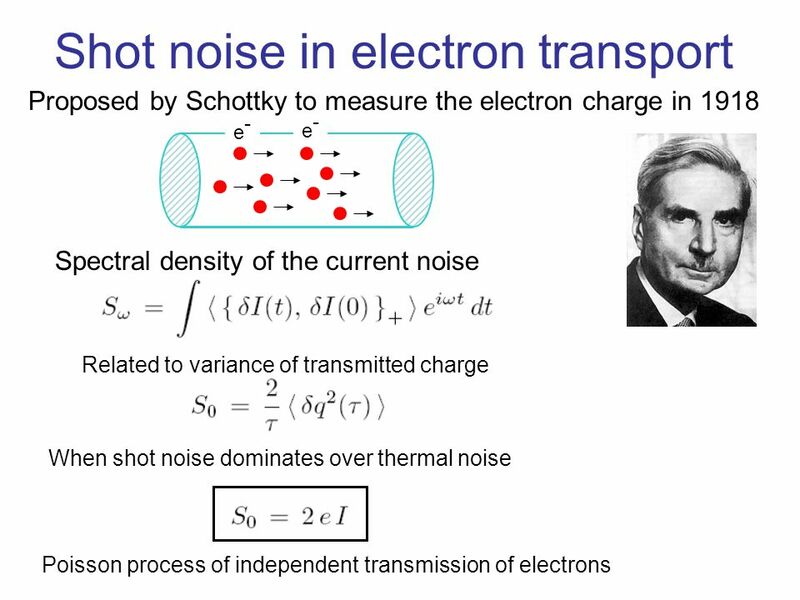 The first study on the shot noise was done by W. Schottky in 1918 examining the elementary fluctuations of the current in vacuum tubes (diodes, triode, etc.). This type of noise is in fact manifest when an electric current, ie a flow of charge carriers, goes through a potential barrier, as is done in vacuum tubes or in the p-n junctions. It comes from the discrete nature of the electric charge and statistical independence of the elementary charge individual crossing events and for this reason is also called granular noise. Shot noise is white up to frequencies of the order of the inverse of the transit time of the electrons. In some devices (eg . : the vacuum diode or the semiconductor diode reverse biased) the passage of electric current is due to the random emission of individual electrons. The system is based on the JCan project : Gellerlabs, described in the following article : jcan-nv-article and in the following post Johnson Noise, Boltzmann Constant and Brownian Motion. In the images below you can see the amplifier mounted on its PCB and attached to the lid of the canister, notice the BNC connector and the two 9V batteries for power supply. On the left of the PCB there are the terminals for the insertion of the shot noise source . 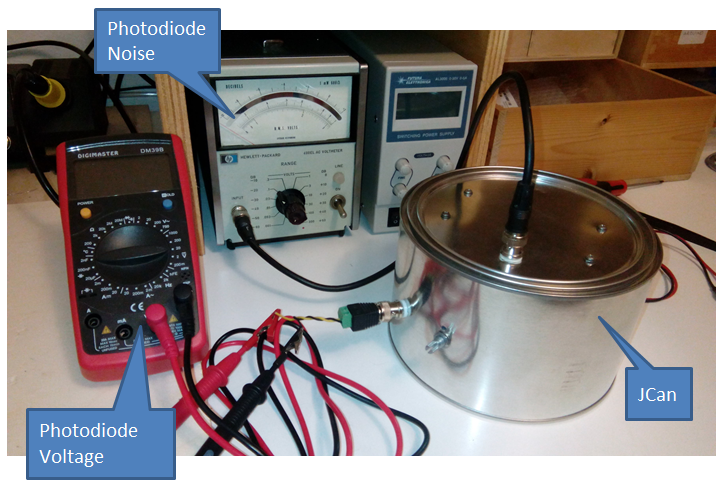 A photodiode exposed to the light produced by a LED has been used as shot noise source. The shot noise is produced by the statistical fluctuation in the number of photons collected by the surface of the photodiode. These statistical fluctuations follow a Poisson distribution: if the surface of the detector receives an average of N photons during an integration interval τ, then the standard deviation of the number of received photons is √N. The photoelectrons created in the detector follow the same statistical and this explains the shot noise of the photocurrent. The photodiode is the Hamamatsu S 1223 model. 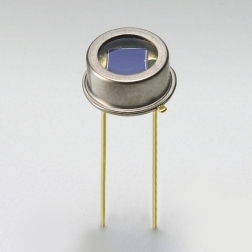 This photodiode is characterized by high response speed, low capacitance and high sensitivity in the visible and near infrared range. The peak sensitivity is around 830nm, the maximum reverse bias voltage is 30V. The photodiode is illuminated by the LED which emits in the near infrared, 840nm, so as to maximize the response of the photodiode. LED and photodiode are positioned opposite one another and protected from light. The photodiode is operated in the photoconductive mode and is reverse biased. The photocurrent is amplified by a transimpedance amplifier realized with the operational amplifier OP 134. 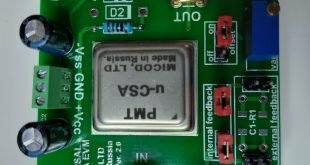 This op-amp is characterized by a FET input stage with low current (5pA), low noise and high speed. The picture below describes the System diagram. The bias voltage of the photodiode is 9V, the feedback resistance Rf is 10kΩ. The signal is sent to both the noise measurement circuit (through a coupling capacitor) and outside the apparatus for the measurement of the DC value which allows us to determine the value of the photocurrent. 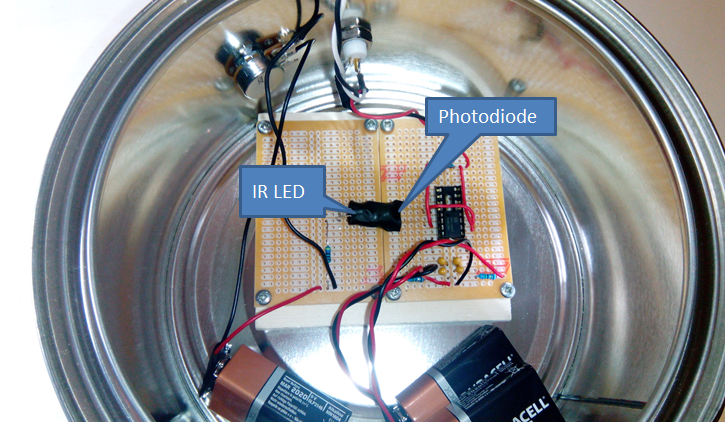 In the picture below you can see the photodiode and the LED coupled and protected from light by a dark jacket. 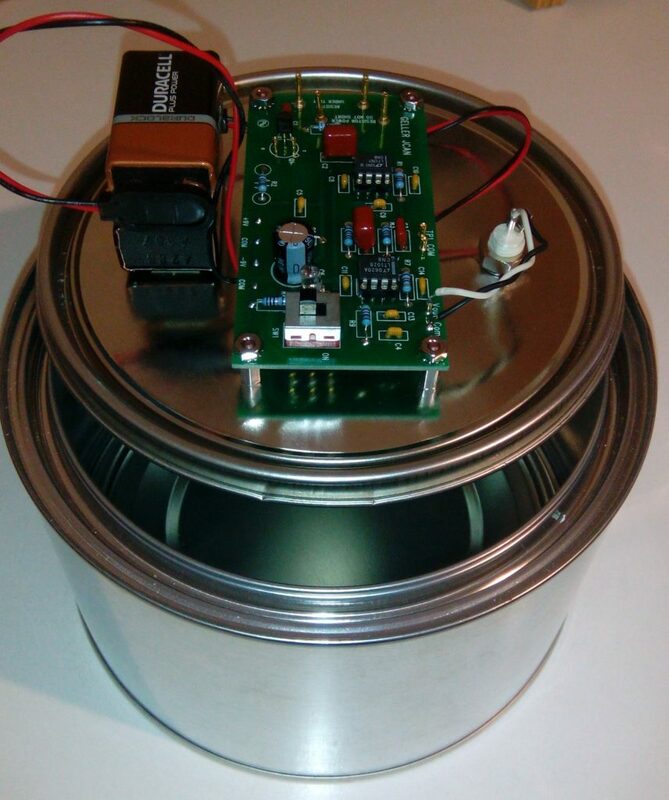 The LED is powered by a 9V battery with a 400Ω series resistor and a 5kΩ potentiometer that allows to vary the brightness of the LED. 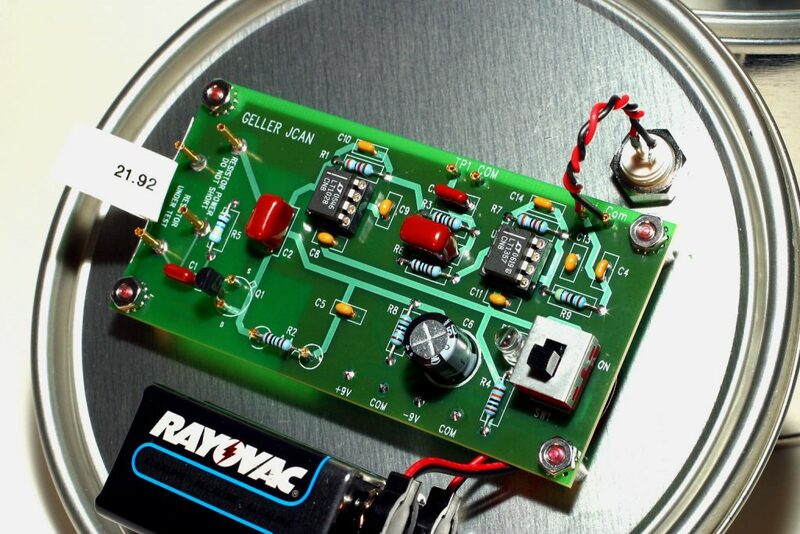 In the image below you can see the system connected to the millivoltmeter for measuring the noise value and the multimeter to measure the DC voltage. For the measurement of the output signal you can use a millivoltmeter as the one shown in the picture below: it is a precision AC millivoltmeter, model HP 400 EL, with the scale ranging from 1mV to 300V. Tools of this type, used, are found fairly easily and at a low price on eBay. In order to obtain the actual value of Vrms the value read from this instrument has to be multiplied by a factor equal to 1.13, this is because the instrument is configured for a sinusoidal signal, while in the case of thermal noise, the signal is random. For voltage / photocurrent measurement you can use a normal laboratory multimeter. Then the circuit must be calibrated in order to determine its operational characteristics. For calibration, you can use the method described in the JCan article, it should also be measured the noise base level switching off the LED. These data should be entered in the Excel template jcancalibrationworksheet_shotnoise. Then the parameters gain and bandwidth must be tuned so that the measured values correspond to the theoretical values. 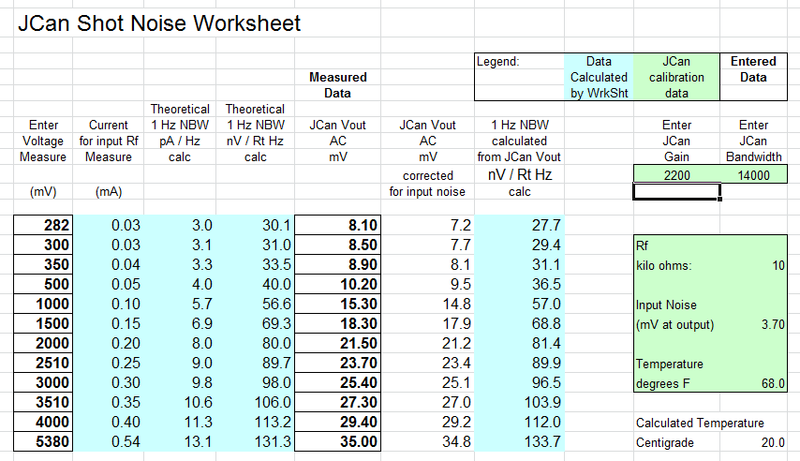 The calculations take into account the noise base level and the feedback resistance. As you can see the correspondence between measured and calculated values is good.